The Neffco bowl was invented by Larry Neff of Utah. He began experimenting with centrifugal recovery of flour gold in 1976 and by 1980 had invented the novel Neffcobowl – it has a single long riffle groove that spirals downwards. Other bowls have grooves in rings. TheNeffco bowl is made by Neffco Mining, of Salt Lake City,Utah –www.neffcomining.com. The maker claims the Neffco bowl, when part of acomplete wash-plant, recovers “better than 95% of the of the flour gold in most materials we have tested” . Anecdotal evidence indicates the Neffco bowl is capable of recovering fine gold. But there are reports of very rounded gold particles sometimes flowing (rolling?) straight out of the unit although these can be caught before or afterwards with a standard sluice (source: Zooka of AGF). To achieve capacity, often 4 or more bowls are run inparallel, and – presumably because of the escape of large high sphericity gold – a long length of expanded metal sluice is used to scavenge the tailings. The Neffco bowlachieves a concentration ratio of 2,000 to 1.To clean concentrates, material is run through two bowls in series, and the second captures about 5% extra. Feed material is screened at 0.3 to 1.5mm, then preferably to <100 Tyler mesh as larger solids may block the groove. If feed is dry it must first be thoroughly wetted, for instance in a longish water trough. The Neffco bowl runs full of water as it spins. Slurryis fed down the central tube to the bottom of the bowland works its way to the sidewall. The bowl and its spiral groove drag the water and induce the water to spin. “It looks like a reverse auger as the groove appears to auger down to the bottom of the bowl”. The drag of the water may aid heavies to move to the sidewall and lights to spiral up.T he slurry is continually swept down the spiral groove. As the slurry spirals down, the heavies end up atthe bottom of the groove while the lighter particles escape upwards and out the top. The end result is that a high percentage of heavies are driven to the bottom of the bowl. Periodically the bowl is stopped for batch discharge. The rpm is fixed, and control is exerted by altering the water input (source: Zooka). The water level is maintained 1.5 inches below the rim and at the rim, withless water for finer cuts. 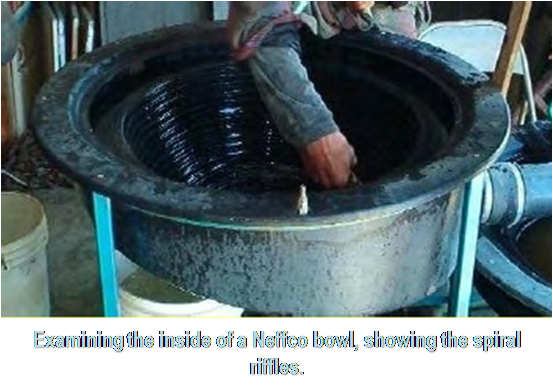 The 24-inch Neffco bowl will run 1-8 tons per hour of solids, uses a ½hp motor, rotates twice per second, uses125 gallons per minute of water and is claimed to be able to capture 500-mesh gold (25 μ). The Gilkey bowl was invented by Walter W. Gilkey of Washington State during the 1960s, and only advanced versions patented. The basic version is a symmetrical steel bowl with open mouth upwards, dynamically balanced around a drive spindle below the bowl. Part of the innerwall is a broad cylindrical channel that holds the mercury. The Gilkey bowl was one of the last of the ‘force damalgamators’ that had been popular for over a century to recover ‘fine’, ‘flat’ and ‘flour’ gold by adding mercury toa spinning bowl to centrifugally press gold into mercury. Many forced amalgamators were invented and patented, such as the McKlellar amalgamator (US #1,003,118 of 1911); the Taber amalgamator (US #1,457,560 of 1923); and the Lorentsen machine (US #1,866,111 of 1932). First, mercury is poured into the stationary bowl, a little less than the capacity of the mercury channel in theside-wall. The bowl is then rotated to drive the mercury into the channel. Next the screened feed slurry is introduced, and the feed density has to be strictly controlled at 20% solids [59,60]. 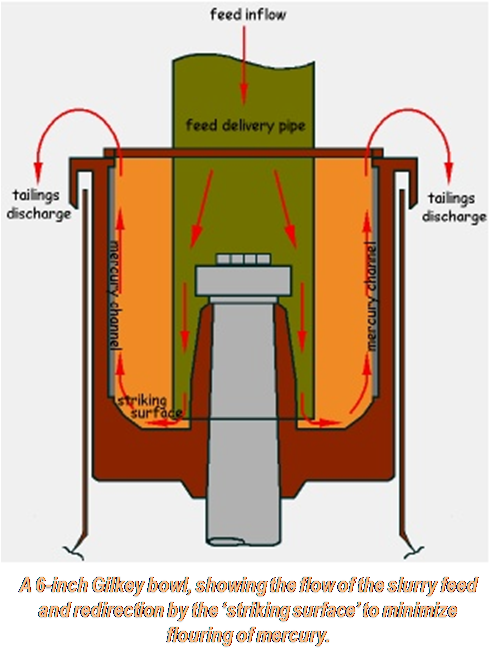 The feed slurry is introduced under a small head of gravity via a central feed delivery pipe, pouring into the middle of the bottom of the bowl. From here the slurry isforced to slam into the sidewall. To minimize flouring, and loss of mercury, the slurry first hits a ‘striking surface at the bottom of the sidewall. Then the slurry flows up the inner wall of the spinning bowl to cross the rotating mercury held in the recess of the channel. The tailings are ejected from the spinning rim of the bowl as a continuous discharge and the risk of mercury being accidentally lost is high so the tailings discharge isimmediately intercepted by a mercury trap. The gold particles in the film of slurry crossing the mercury are forced to amalgamate. After a period the feed is shut off and then the power shut off to slowly bring the spinning bowl to rest. The gold is then recovered from the mercury by squeezing through a fine cloth to retain the Au-Hg amalgam as a paste, and the amalgam is then subjected to firing and retorting to separate and recover the gold and recycle the mercury.